Magni-Tech Industries Bhd, through its subsidiaries, is principally engaged in manufacture and sales of garments. In addition, the company also manufactures and distribute flexible plastic and corrugated packaging products. The company is organised into two business segments namely Manufacturing and sales of packaging materials and Manufacturing and sales of garments. The group operates in Malaysia for manufacturing and sales of packaging materials and garments and in Vietnam for manufacturing and sales of garments. Manufacturing and sales of garments segment contribute majorly in the company's revenue. cyeec2000 Cyptocurrency has their own risk which has no forever in upward trends too..
yfchong When is the 2nd plant coming up? enigmatic I believe Magni is a diamond in the rough. It will shine brightly when people realise the importance of constant dividends. ehtan vs moving. why magni not yet? warrantKing 21.89 sen EPS and Declared 8 sen dividen for this Quarter !!! JayC previously when they announce such good profit, the price went all the way up to RM7!!! Magni is a proxy to investing in NIKE. NIKE never fail to show growth for the past 10 years. enigmatic is this not a KYY golden rule stock? kk7198 When kyy comes in, easily another HengYuan. zhangliang such good results man! wakarimas next year olympics a catalyst to Magni?? 4. China sports brand Companies are Nike Strong competitors (Li Ning, Xtep, Kbird, 361 and many others) which sell good quality branded garments at cheaper price. The trend now prefers China products compared to US products for instance HuaWei outbeat Apple. 8. Many of retailers prefer to buy pirated Nike products and sell to consumers at affordable price. 10. Trading Markets flavors oil related shares compared to garments. Current theme is oil! LongTermInvestment Lol.. The last point sum up your reasons. You want ppl to join the oil theme.. Look at Dayang from 1.70 to 1.30. Good luck speculating oil companies. apple168 We earned more than 50% from Dayang. Bought at 0.80+ and sold all at 1.50+. Now, we riding Hibiscus. Sour grape, longterminvestment, continue to hold your Magni with low liquidity. LongTermInvestment Good luck in hit and run. Good over the place to promote your hibiscus. Cheers. apple168 We agreed with Cold Eye view on oil stocks. He has been promoting oil stocks since end of 2018. With cold eye good track record, kyy also can’t resist it and jump into the oil theme to grab free market money. LongTermInvestment Thanks for sharing. How many percent u suggest we can earn from current hibiscus price? apple168 We are not promoting to buy hibiscus now. Current hibiscus share price is rather high. To be frank with you, buying at current price carries huge portions of risks. We are considering to dispose hibiscus in the coming month. apple168 Magni is our topic. Not hibiscus. 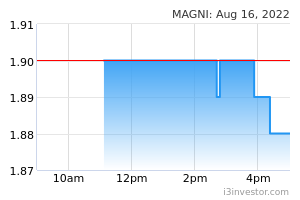 Current magni share price is VALUE TRAP! Remember this. LongTermInvestment Okay then my team will sell hibiscus tmr and avoid hibiscus at all cost for now. Thanks. chesslim Value trap ! ? , if no confident, can sell all now ! LongTermInvestment Will history repeats itself? klout Apple168, is Cold Eye using new handler to comment now? wakarimas anyone know magni previous PE value around how much? apple168 Long term investment, Hibiscus up up up. You miss the opportunity to earn extra if you hv sold it. 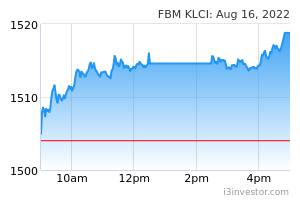 warrantKing USD strengthen again MYR again. MrPotato88 It’s fundamental is strong with no debt, reported increasing earning in 3 consecutive quarters, PE less than 10, new plant to commence this year, potential catalyst from 2020 Olympic...is now the time to enter ?? 4444 3.88 better price to buy? dnlt Average PE for the past 5 years should be 8.x times. In 2015, it hit the max 10.x before came crashing down. anyone know magni previous PE value around how much?